A major Beach Restoration and Public Access project has transformed Albany Beach into a lovely spot to watch a sunset, have a picnic, or hang out with your dog on the beach. Disabled access improvements include, new accessible restrooms and picnic tables, and two short boardwalks on the upper portion of the beach. 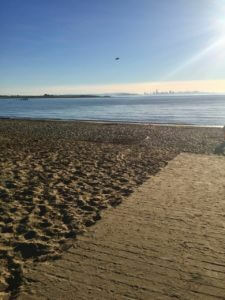 The boardwalks don’t get you close to the water but the view is nice from them and BORP is reaching out to East Bay Parks to request that they acquire a beach wheelchair which would make the beach more accessible. Surrounding trails at the Albany Bulb offer some access although the dirt trails can be muddy during the rainy season; a paved trail alongside Buchanan St. has a few bird viewing decks. Phase 3 of the project will result in a 1-mile shoreline extension of the San Francisco Bay Trail between Albany Beach and Gilman Street. Once completed in late 2019, cyclists and pedestrians will no longer need to traverse the steep hills of the racetrack to connect from Gilman St. to Buchanan St. This will be a welcome change for BORP cyclists. The disabled parking spaces closest to the beach aren’t great but better ones are along Buchanan St. before you reach the beach. New parking is also planned for Phase 3. Click here to view a map and construction update.